Trash Backwards: Innovating Our Way to Zero Waste examines the various kinds of trash Americans are producing in staggering quantities, and profiles a range of innovative processes, people, and companies who are thinking creatively about how to not just reduce pressure on landfills, but redefine what’s possible in the realm of recycling. This E-ssential offers insights into the motivations and inspirations of people working on cutting edge processes of waste management and land reclamation in America—from household trash to biowaste processing to reclaiming brownfields. We’re at a critical juncture with our waste production— and among all of the other problems on Earth (climate change, war, stagnant economies), this is the one that ingenuity, as well as a little old-fashioned conservation, can put a big dent in, if not solve. 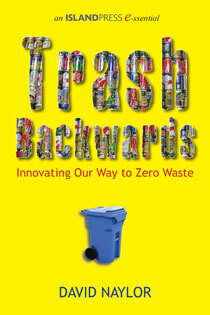 "In Trash Backwards David Naylor raises essential and provocative questions about the need to entirely rethink the whole concept of garbage—and how important it is to move toward a future where is no such thing as waste." Elizabeth Grossman, author of "High Tech Trash"